Easter has come and gone and many are still enjoying the bounty of Easter candy; either from friends, family, sales or the Easter Bunny himself. This year, though, I found that one of my favorite Easter treats had changed. 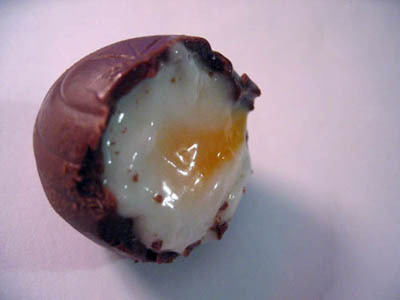 No, I’m not referring to the fact that Cadbury’s Creme Egg came out in an Orange flavor. I mean that this year’s Cadbury Creme Egg is smaller than last years! I noticed it when I was looking for the nutritional information and found a box I had saved from last year’s stash. When I compared it to the numbers on the new boxes, I was surprised when the numbers were different and then I realized that this year’s egg is 5 grams smaller. Interesting. As the world’s largest confectionery company, Cadbury Schweppes is committed to developing great-tasting products that you, the consumer loves. Since people’s preferences vary from market to market, so do our products. This is reflected in the broad variety of sizes and flavours of products that we offer our consumers worldwide. That’s some great PR spin on why they got smaller. Anyone else noticed this (or other candy) being smaller? You know, I had some slightly less savory words to describe that PR spin, considering it sounds like a load of you-know-what. I guess they decided “We were hoping we could charge the same price for less product and make a great profit” wouldn’t have sat so well with consumers. I have noticed this over the years with Chip bags (ever notice how you seem to be buying more and more AIR instead of chips/crisps). We studied it in one of my college media courses. They actually made that bags bigger one year and dropped ounces by 2! I actually like the new Cadbury egg size. I thought the larger ones were too sweet and hard to finish one. I rarely ate them. My husband bought some this year and now I can eat them and enjoy them. Having said that, they should NOT charge the same price for a smaller product. That’s hooey. What’s up with that? Has the UK and Canada always had smaller eggs or do they get the bigger ones while the US gets the smaller ones? That’s odd. Maybe online you can order the regular sized ones from a Canadian candy company? Today (Dec 07) I bought a Cadbury Caramello Bar, which has shrunk in size by 1/2 oz, or 14 grams, from two months ago. The price is the same though. Hershey makes Cadbury candy in the U.S. under license. Reducing the size of a candbury egg will put no one on a diet. This is purely a move to retain profit margins on a product.